Organizing a Chest Freezer is going to save you tons of time and save you money! It is no secret that buying in bulk creates substantial cost savings – and if you are buying in bulk you need the space to store it. Buying a chest freezer is a cost-effective way to accomplish that. But a chest freezer is… well, a big deep box. So it is easy to just throw things inside and never to find those items again! Organizing a chest freezer is easier than you might imagine, and you can actually do it for free – or very inexpensively depending on your strategy! This post contains a few Amazon affiliate links to products that have helped me organize my chest freezer – I hope they will help you too! The important part of the organization process is separating the items in your chest freezer. You can choose a number of different methods, it depends on your budget as to what containers you use. The simplest way is to use cloth grocery shopping bags, you will be able to quickly grab the items that you need and you won’t lose items of food which can easily become buried. It is also helpful to use chest freezer baskets and boxes to organize your chest freezer, you can even choose a particular color depending on the item that you are storing. By using different colors you will quickly identify the storage box that you are looking for. Boxes are great as they will be stackable, this will allow you to use the full height of the chest freezer as you can move the boxes to obtain other items. Remember to choose square or rectangle bins in the freezer! Many chest freezers come with a basket that rests at the top of the freezer. These are great for organizing some of the smaller items that you might want to freeze. 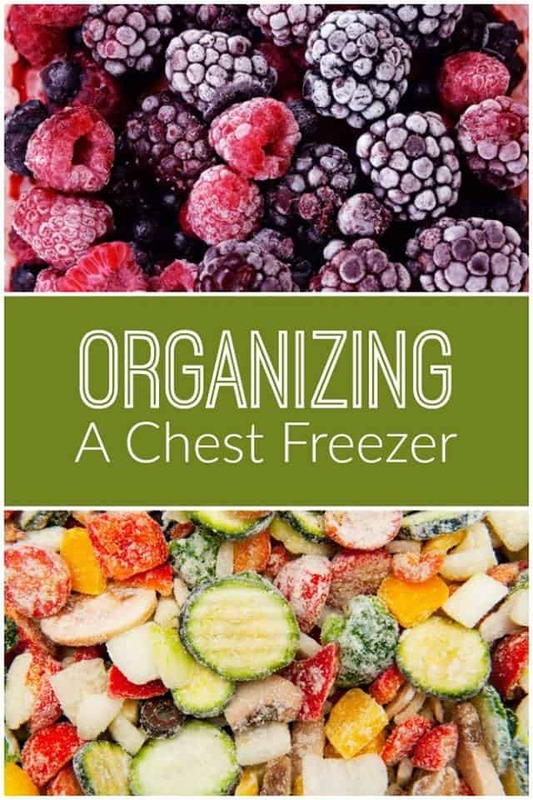 You can easily organize the top area of your chest freezer. Use these for storing small items and treats, this makes sure that if a child has access to the freezer, they are not rummaging through the entire contents looking for a popsicle! It is possible to use a Chest Freezer Divider for organizing the contents. These are less effective as you will need to look through the different sections for the items you require! Labeling your items in the freezer is so important, it allows you to identify boxes, bags, and containers without looking and making a guess as to its contents. I really like these larger labels that include space for my messy handwriting and the date the food was put in the freezer. I also keep a sharpie in my kitchen to label items that have surfaces that won’t smear. Including a date on your label allows you to check which items need eating first and creating a rotation system within your freezer. So no more cleaning out your freezer and finding a 3 year old pork loin. If you know what is in your chest freezer without opening the lid, it is easier to plan your meals and menus, as well as what you need when you go grocery shopping! Keep your inventory near the freezer, it makes it easier to cross off items or add them after a shopping trip! Keep a pen by your freezer inventory so that you can easily check off and add as you use items for meals. Organizing your chest freezer isn’t difficult and you can do it for cheap! Remember that the only value in buying in bulk is that it saves you money. Having a simple system for organizing a chest freezer will make sure you use what you buy in a reasonable amount of time. Keep in mind when creating the system that works for you, the simplest idea is often the best one as it will be easiest to maintain long-term. 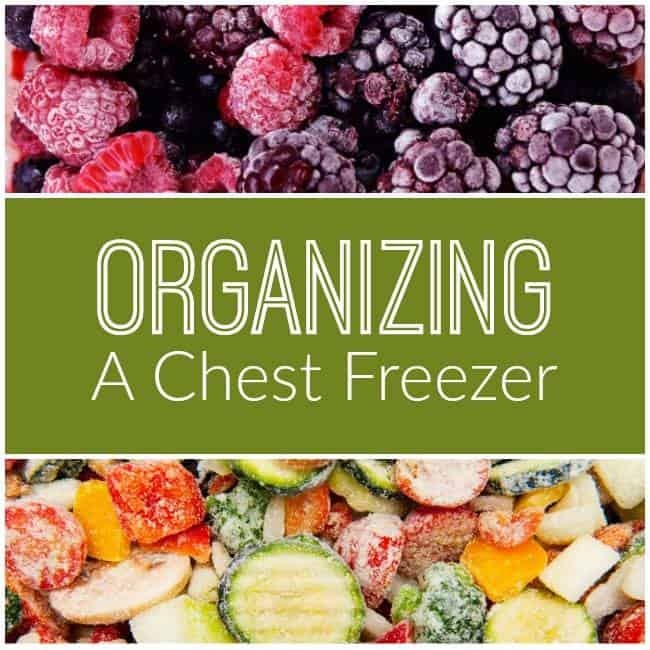 How do you organize your chest freezer?